Burt Neuborne is the Inez Milholland Professor of Civil Liberties and founding Legal Director of the Brennan Center for Justice at NYU Law School. For 45 years, he has been one of the nation's foremost civil liberties lawyers, serving as National Legal Director of the ACLU from 1981-86, Special Counsel to the NOW Legal Defense and Education Fund from 1990-1996, and as a member of the New York City Human Rights Commission from 1988-1992. He has argued numerous Supreme Court cases, and has litigated literally hundreds of important constitutional cases in the state and federal courts. He challenged the constitutionality of the Vietnam War, pioneered the flag burning cases, worked on the Pentagon Papers case, worked with Justice Ruth Bader Ginsburg when she headed the ACLU Women's Rights Project, anchored the ACLU's legal program during the Reagan years, and defended the Legal Services program against unconstitutional attacks. He currently directs the legal program of the Brennan Center, especially its efforts to reinforce American democracy and secure campaign finance reform. The Brennan Center was established in 1994 to honor Justice William Brennan, Jr.’s monumental contribution to American Law. At the same time, Professor Neuborne has forged a national reputation as a constitutional scholar and teacher. In 1990, he was the recipient of the University-wide Distinguished Teacher Award at New York University for his work in teaching Civil Procedure, Evidence, Federal Courts and Constitutional Law. He is the author of three books and over 20 law review articles on diverse areas of constitutional law and procedure. Among his best known scholarly works is the two-volume Political and Civil Rights in the United States, which he co-authored with NYU colleagues Norman Dorsen and Sylvia Law and the Deputy Solicitor General of the United States, Paul Bender. His 1992 lectures on American law at Universitat Pompeu Fabra in Barcelona have been translated and published in Spanish. In 2001, in recognition of his scholarship and his work in the courts, Professor Neuborne was elected to membership in the American Academy of Arts and Sciences. In 1996, Professor Neuborne appeared as Jerry Falwell's lawyer in Milos Forman's The People v. Larry Flynt. For the past 14 years, Professor Neuborne has served as a principal counsel in a series of lawsuits seeking to recover property unjustly taken from Holocaust victims by Swiss banks and German corporations during the Nazi era. The litigation has succeeded in assembling more than $8.5 billion for distribution to Holocaust victims and their families throughout the world. Professor Neuborne was appointed by the Court to oversee the $1.25 Swiss bank settlement, and was appointed by the United States to serve on the Board of Trustees of the German Foundation “Remembrance, Responsibility and Future,” established to distribute the $5.2 billion settlement in the German slave labor litigation. Professor Neuborne is married to Helen Redleaf Neuborne. 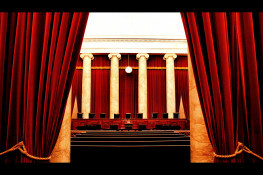 Will Originalism Survive the Death of Justice Scalia?